Accueil > Our Collections > Pen Duick VI x Marie Tabarly > Men's Polo shirt "Pen Duick VI"
In partnership with Marie Tabarly, the "Pen Duick VI" collection resonates like an allusion to her father, Eric Tabarly. 727 Sailbags pays homage to him with its men's polo shirt. Its red pattern is taken from the sails of the Pen Duick VI, that sailed with Eric Tabarly. This men's 100% cotton polo shirt is an elegant piece with its "Pen Duick VI" authenticity labels. An historic sailcloth for a unique men's polo shirt. 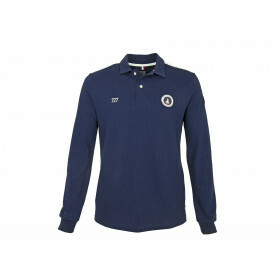 Men's Polo shirt "Pen Duick VI"